ItemMS-3100.11.31 - Indian chiefs [sic] grave amongst the goodly cedars of the primeval forrest [sic], the body wrapped in blankets and placed in the canoe which is resting in a slanting position against the branch of a tree - another body in a square box above it - when the body is too large for the box the legs and arms are doubled up the lid is then jumped upon until it is closed as much as can be, then bound round with withes. F.D. ItemMS-3100.11.33 - [Indicated by arrows]: Herrings drying. Hut of mats. Indian man. Indian woman in blanket. Three canoes. A cove in Esquimalt Harbour, Vancouver Island, shewing [sic] an Indian family encamped during the herring season. ItemMS-3100.11.35 - An Indian encampment Esquimalt Harbour [On reverse]: Indians encamped in a small cove, showing the rush mat habitation, mode of drying herrings, Chinook-shaped canoes, by the landing stage Esquimalt harbour, Vancouver Island. 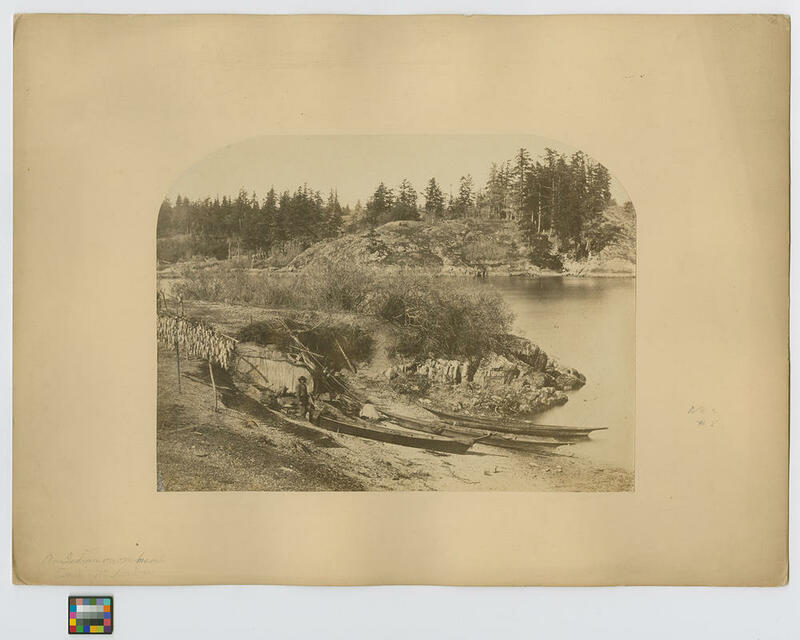 Item MS-3100.11.35 - An Indian encampment Esquimalt Harbour [On reverse]: Indians encamped in a small cove, showing the rush mat habitation, mode of drying herrings, Chinook-shaped canoes, by the landing stage Esquimalt harbour, Vancouver Island. An Indian encampment Esquimalt Harbour [On reverse]: Indians encamped in a small cove, showing the rush mat habitation, mode of drying herrings, Chinook-shaped canoes, by the landing stage Esquimalt harbour, Vancouver Island. 1 mounted albumen print, 26.5 x 36 cm. Located in Container 001111-0002, Folder 6.